It seems that a few years ago there were plenty of manufacturers who produced very good quality necks that were pretty close to vintage specifications and for a reasonable price. Fender over the years have produced a few types of neck, firstly the one piece maple with skunk stripe, this was followed by the slab-board neck in the very early '60s with the truss rod installed in the more conventional way under the fretboard, then the veneer rosewood fretboard which as the name suggests was a lot thinner than the slab-board, the fretboard neck join followed the same 7-1/4inch curve as the playing surface. From a personal point of view I have always liked the veneered fretboard type of neck, there is a number of theories as to why Fender chose to build necks like this. I have seen slab-board necks that have developed a back bow some people suggest that this is due to the dense nature and thickness of the brazilian rosewood, using thinner veneers avoided this but the more likely reason is that it was a thrifty move by Fender. Anyhow Fender had now satisfied the bequest of musicians by incorporating a rosewood fretboard which didn't show up unsightly playing wear stains. 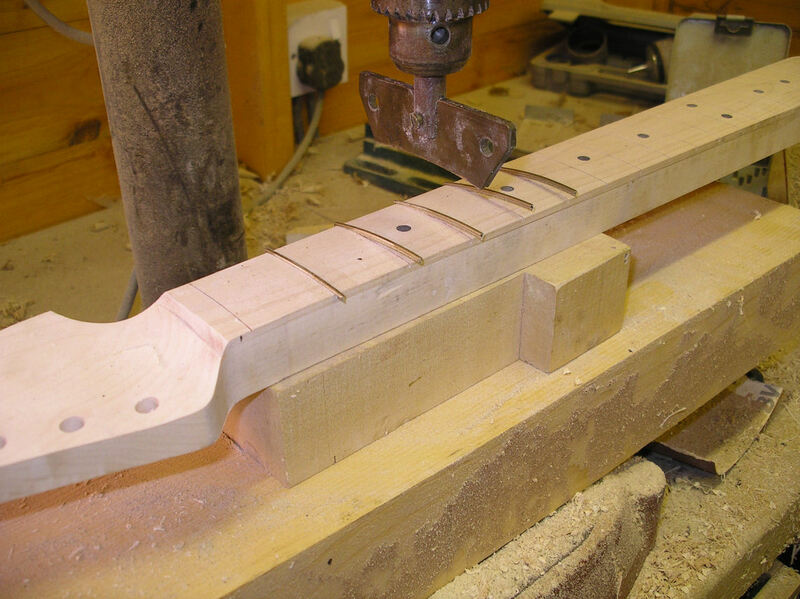 But for those players who still favoured maple necks Fender did produce maple veneer necks for a short while in 1968 and 1969 before re-introducing the one piece neck with skunk stripe. 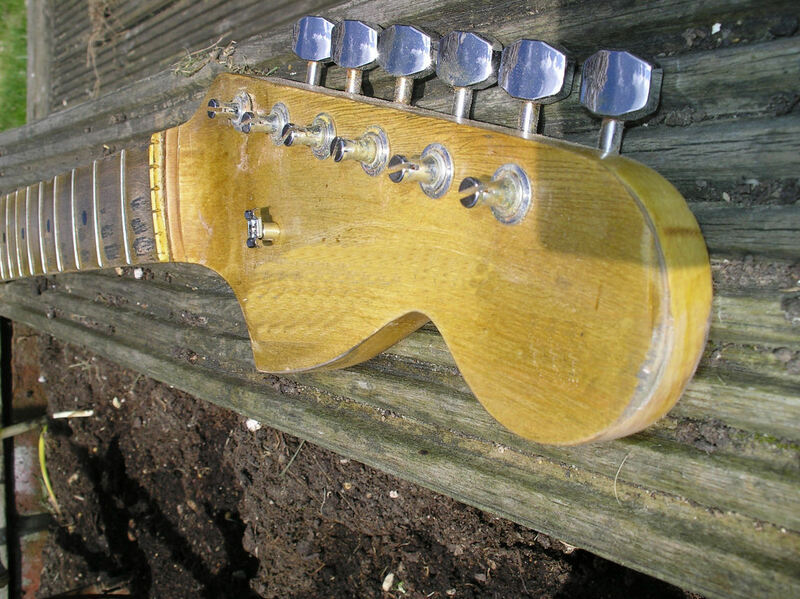 Just over the last few years the prices of really good quality aftermarket necks has risen dramaticaly and a lot of the so called "vintage" ones are quite far off the mark, for a start the truss rod nut is always low compared to a genuine vintage neck, none use genuine brazilian rosewood and I always have issues with the appearance of the clay dots. 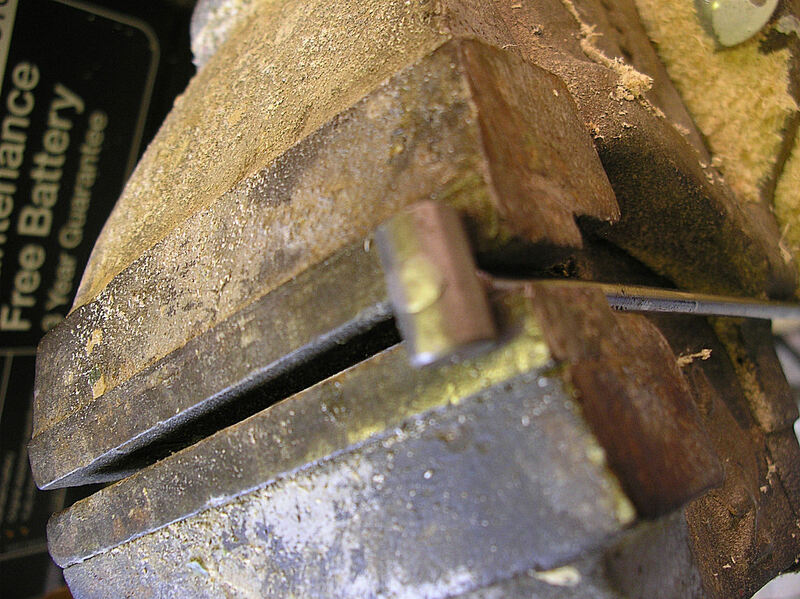 Building a neck from scratch is a time consuming painstaking process and it HAS to be right, it's the heart of the guitar, vintage necks were hand built, hand carved and hand sanded, modern machines can do wonderful things but I don't think they can replicate the tactile nature in which old guitar necks were made. Anyhow I digress! 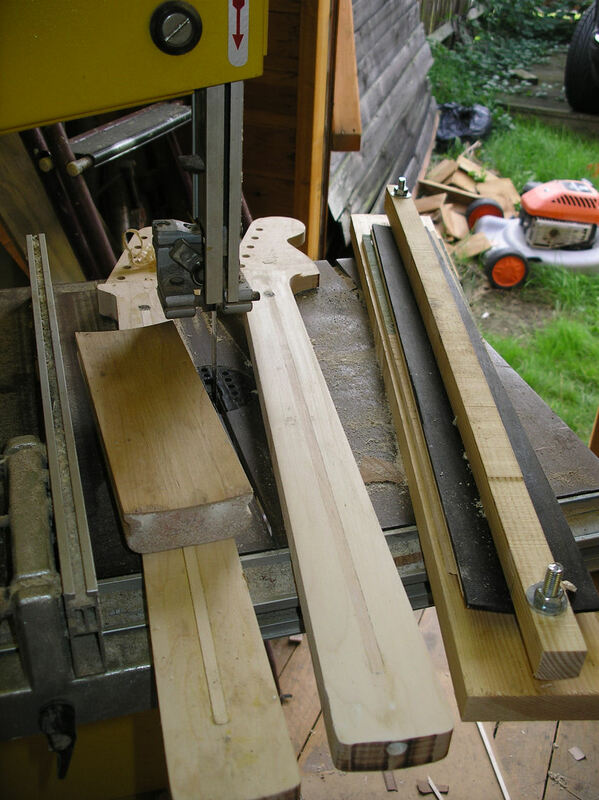 In nearly all my guitar builds I will build my own neck but recently decided to concentrate on producing veneer board necks and put together some jigs to help me manufacture them accurately, so below is a picture book of how I do it. 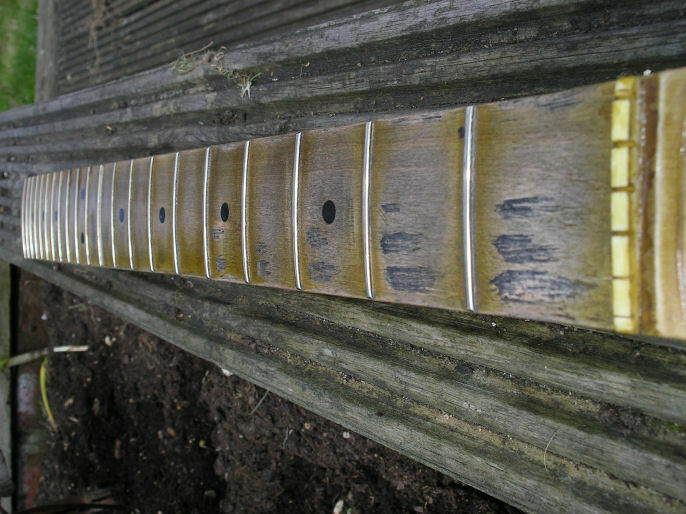 Here's a picture I found on the web of a couple of Fender necks that have been sawn down the middle to show the truss rod curve, the top is a '50s/one piece maple neck and the bottom a later '70s neck with bullet truss rod adjusted from the headstock end. The truss rod is a 3/16" steel rod set in a curved channel. 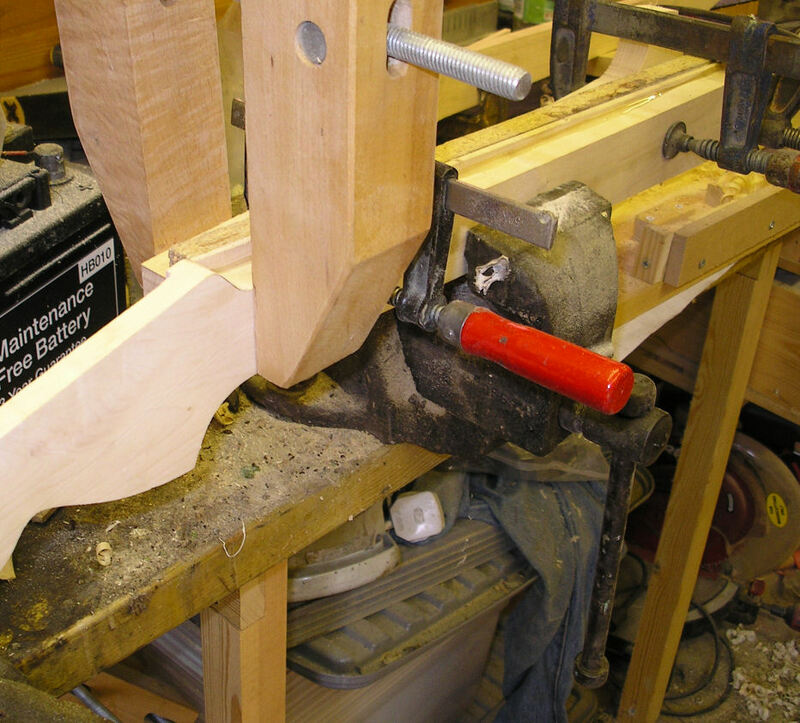 By modern standards this is considered one of the more basic designs, tightening the rod forces it to straighten and hence give the neck a back bow. If the neck develops a natural back bow there's nothing you can do about it. 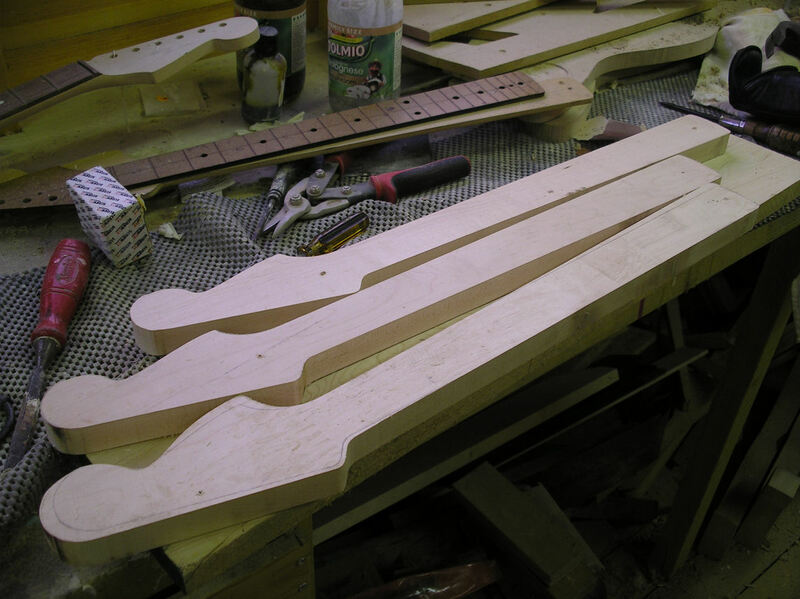 More modern dual action truss rods can bend the neck both ways. 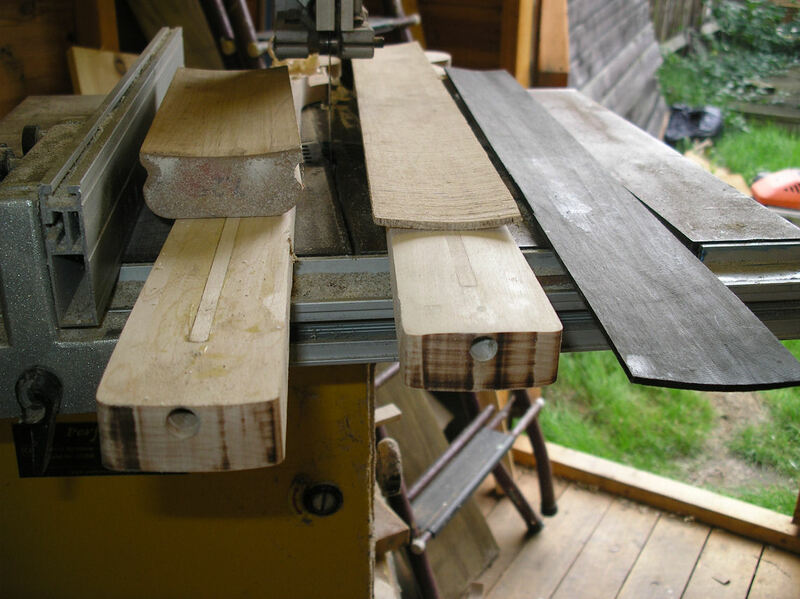 Here are three neck blanks being cut, these are pretty plain maple blanks, I didn't want to spend too much money on fancy woods if I was only going to produce fire wood at the end of it! Reducing them to the correct thickness. It's very easy nowadays to look at Fender guitars as just electric guitars but I always thought that the method of construction and design was quite revolutionary, while other manufacturers were producing more traditional instruments Leo looked at the construction of the electric guitar in a completely new light and almost took it out of the hands of luthiers, designing something that could easily be mass produced. Tidying up the plan shape, one small and one large headstock, I think it's pretty unanimous that CBS models are considered poorer quality, but I have to say that I do like the large headstock. If I had the money a late '60s four bolt neck Strat would be my weapon of choice! 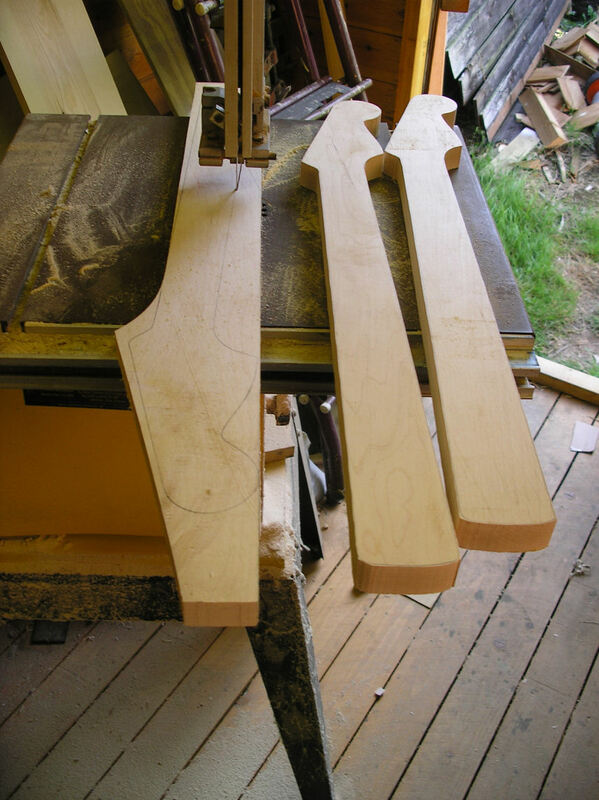 Three neck blanks routed to shape. 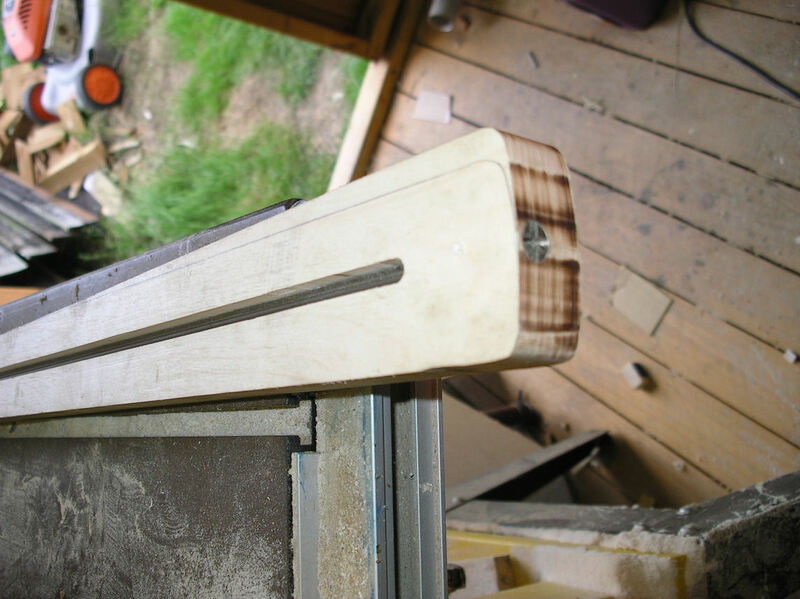 Drilling the tuner holes, a basic looking jig but it does the job well, it's screwed into waste wood and once the headstock is trimmed to thickness the temporary screw holes are removed. 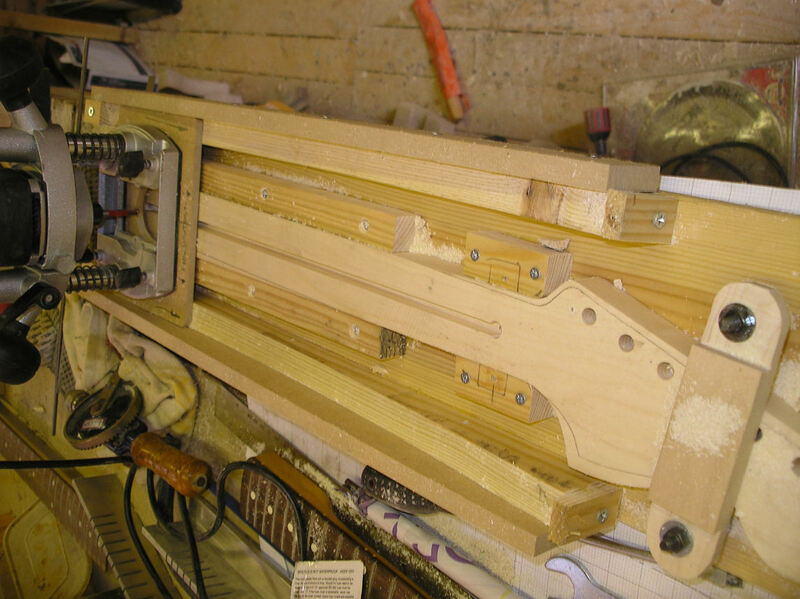 Well now I'm getting to the specialist bit, this picture gives a clue to the jig that I've built to produce the necks accurately, installing the truss rod is quite an exacting process and I built this jig to ensure total accuracy. 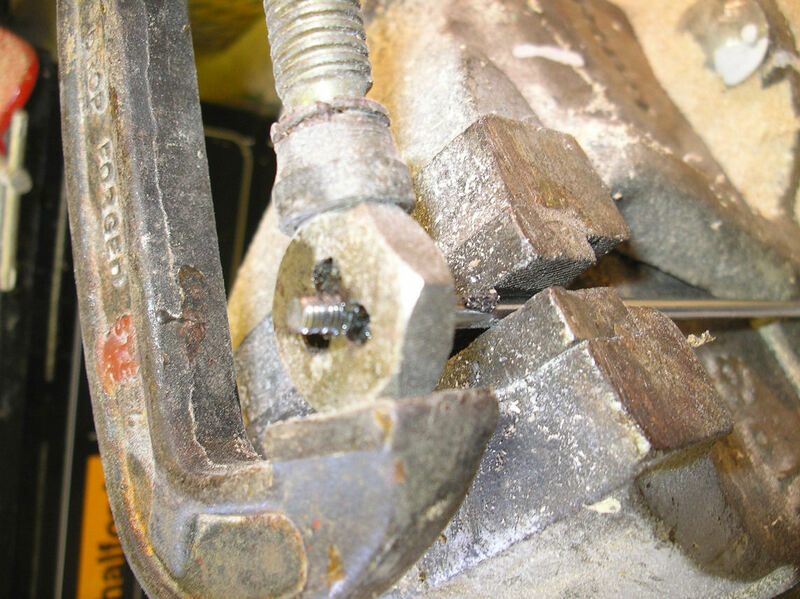 As the rod is installed on a curve both the adjustment nut and anchor point must be fitted at an angle hence the steel guide block has a 3/8" hole set at an angle. 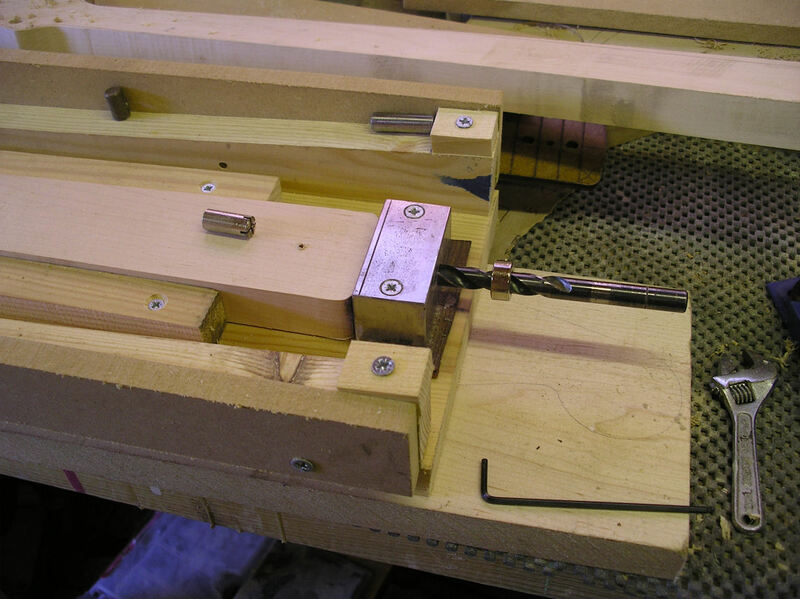 Once the nut clearance hole is drilled I insert a tube with a 3/16th hole for the truss rod, so using the jig both holes are at the correct angle and in the right place, something that's very much down to luck if you try it free hand! 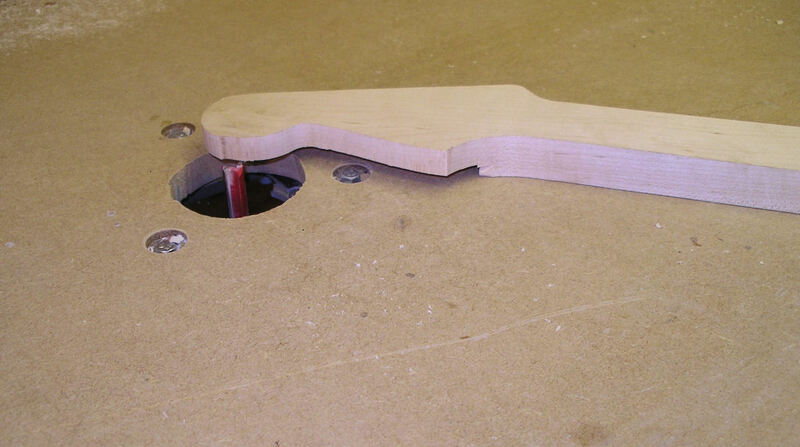 ....And the anchor barrel at the fixed end of the truss rod is also drilled at the same angle. 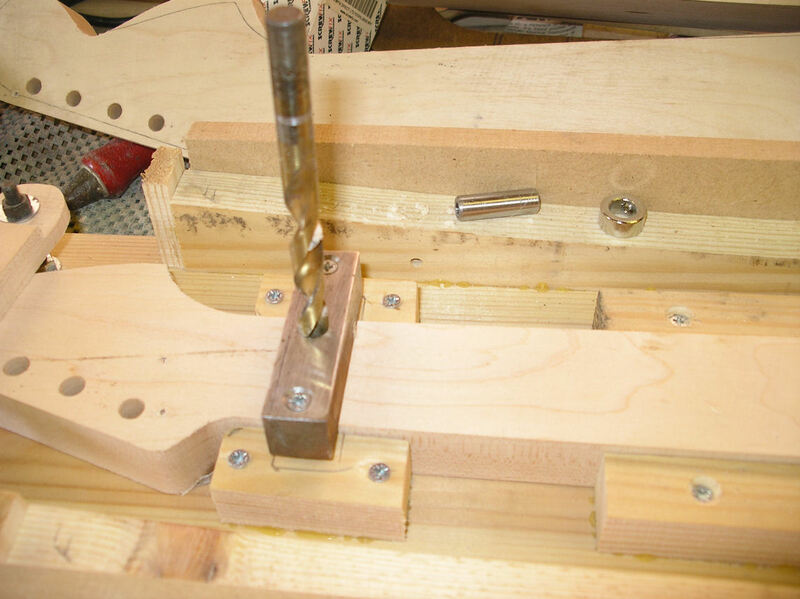 It's important to get these angles correct to allow the truss rod to work correctly and without putting undue strain on the anchor points. 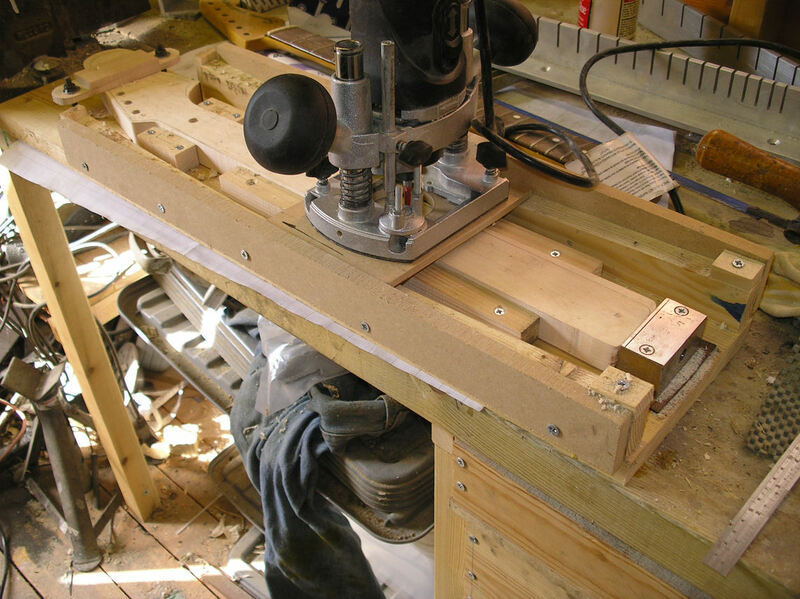 ...And the slot cut, the neck is firmly clamped in the jig the only variable is getting the channel the correct depth which can be done with the router depth stop. 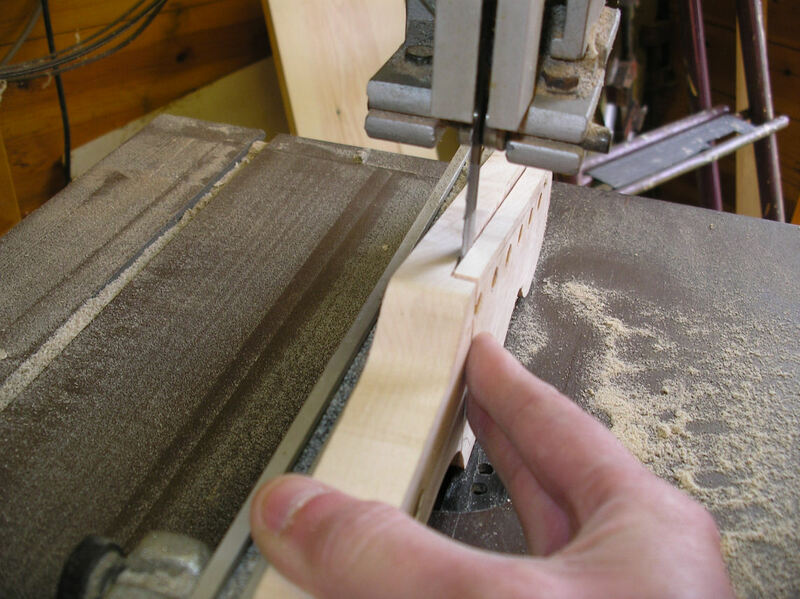 These were the first necks I have built using this jig and I was very pleased with the results, all the "guess work" has been taken out of the process. Everything lines up perfectly. 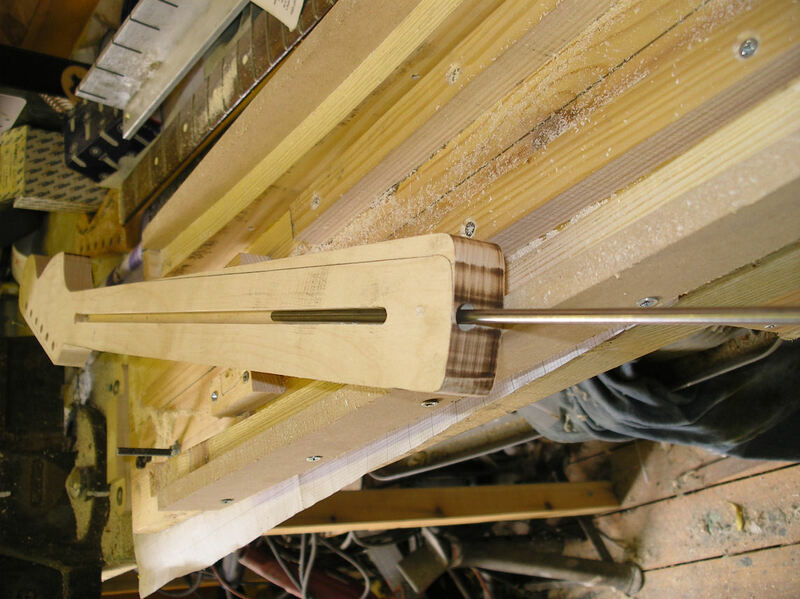 Making the truss rod a tight fit in the channel which is vital for smooth effective operation, a truss rod that isn't tight may rattle and not apply the correct force or enough force to bend the neck. Cutting the 11/32 UNF thread, Ummm yeah I know I should get a proper die wrench but a G-clamp serves the purpose! 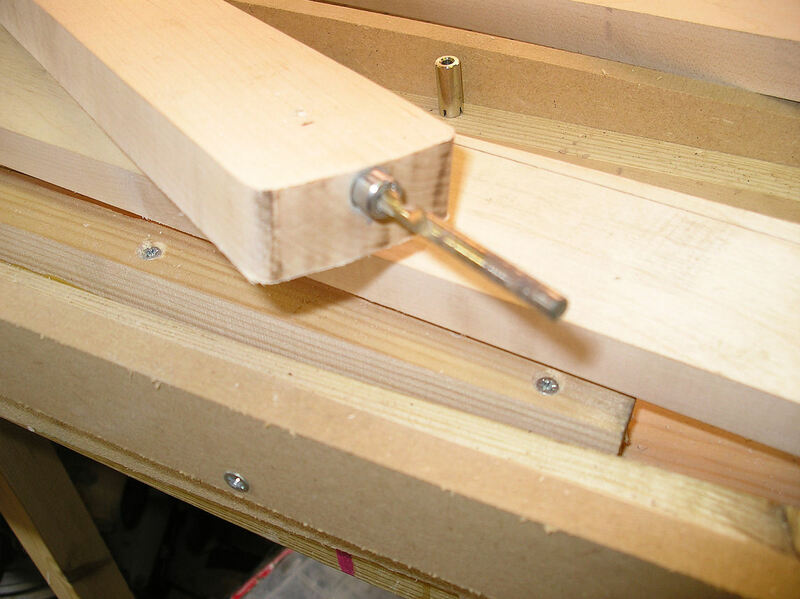 The anchor barrel is threaded and to prevent it unscrewing the end is peened over. 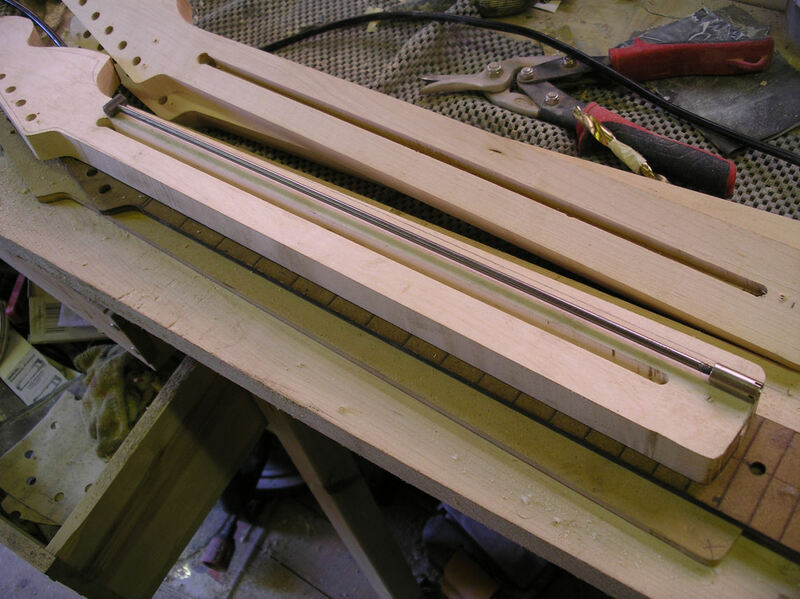 The completed truss rod ready to install. 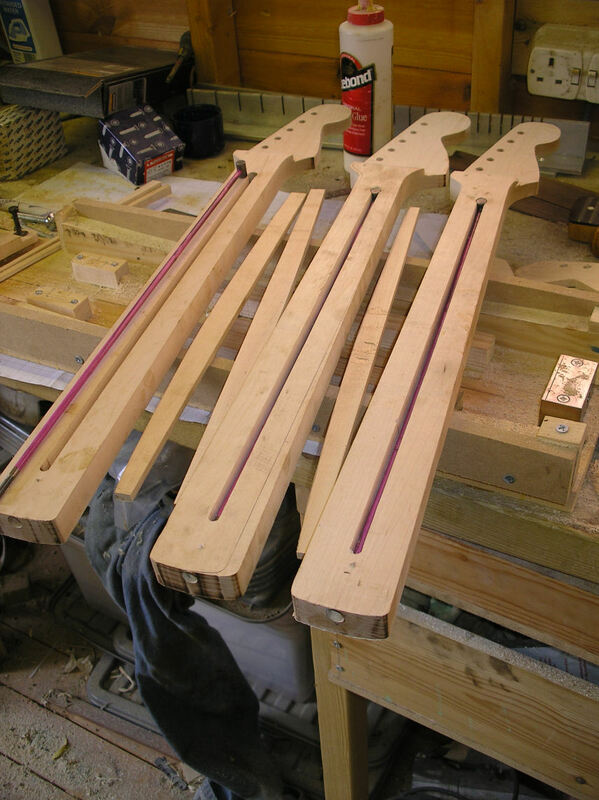 The three necks laid out with fretboards and filler strips cut ready to glue in over the truss rods. The truss rods in place. Rather un-technical but the rods were oiled and sleeved with drinking straws! This prevents any glue sticking to them and ensures smooth operation. Also the filler strips cut to profile and ready to glue in, it's important that they fit tightly to the top of the metal rod which ensures that they work effectivly. Rough trimming the headstock thickness, well worth taking extra care at this stage with your left and right, measure twice cut once... AND yes I do have an unintentionaly partly built left handed neck under my bench..Grrrr! 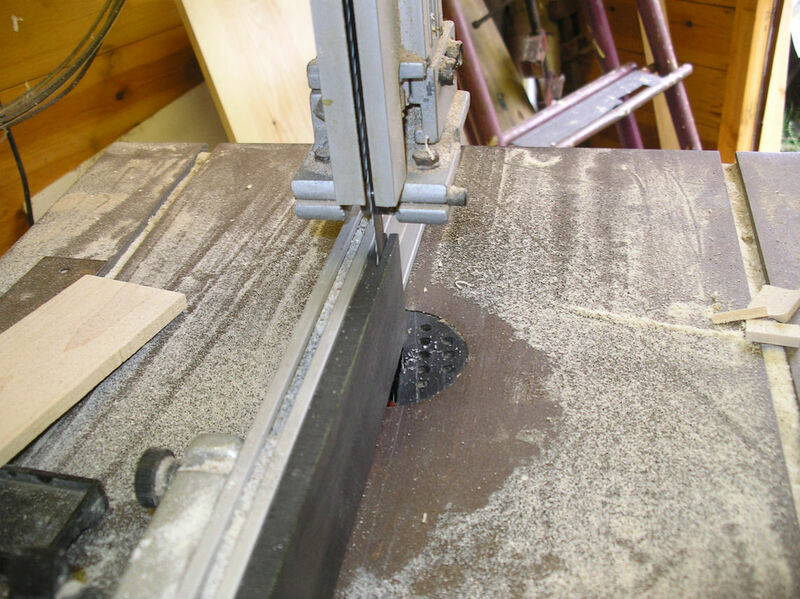 Using my router table to cut the correct thickness for the headstock. 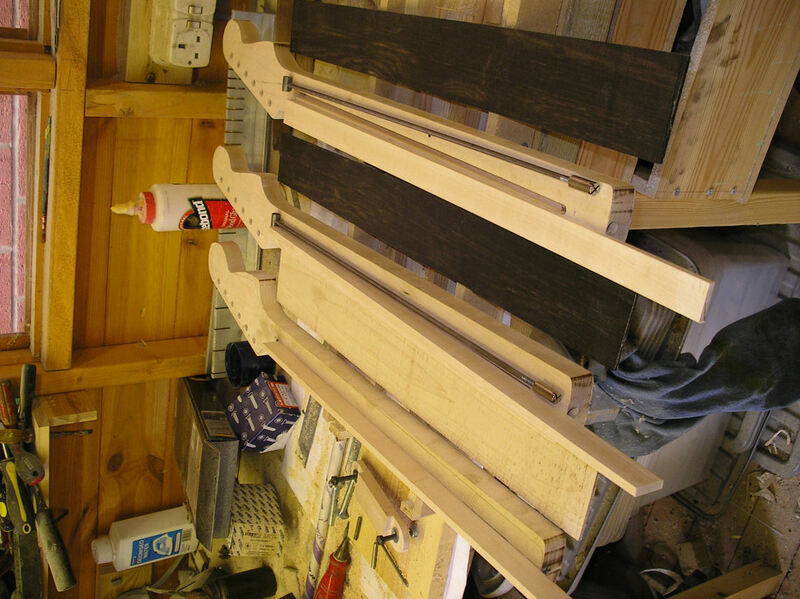 One of the advantages of making veneer type curved fretboards is that you can get two from one blank, time to use the widest newest bandsaw blade that you have, If I can't get hold of genuine old brazilian rosewood that comes up from time to time on ebay, ebony is a very good alternative, some red dye will turn any brown streaks red'ish and make it look pretty convincing. 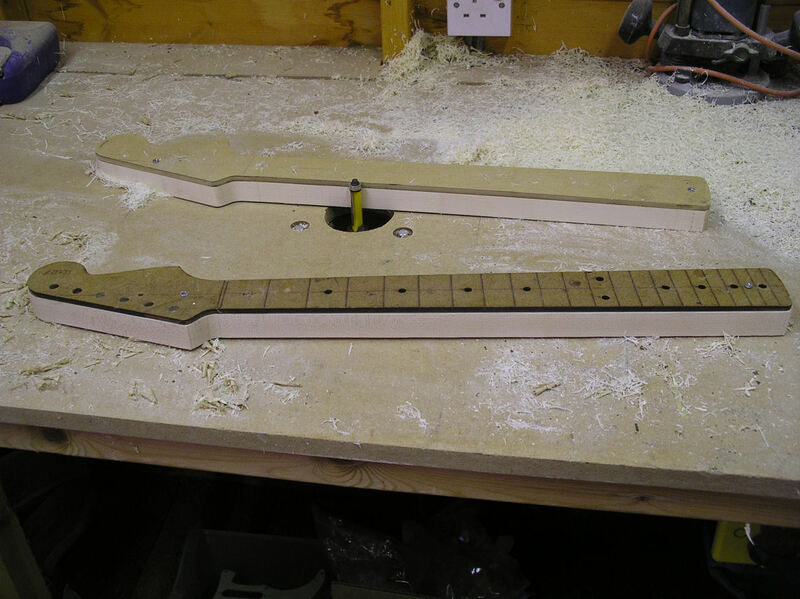 Gluing the boards on the neck using a clamping caul, I use an epoxy glue for this which is the generally accepted method as most standard wood glues are water based and in this case can cause the wood to expand and bend the neck. 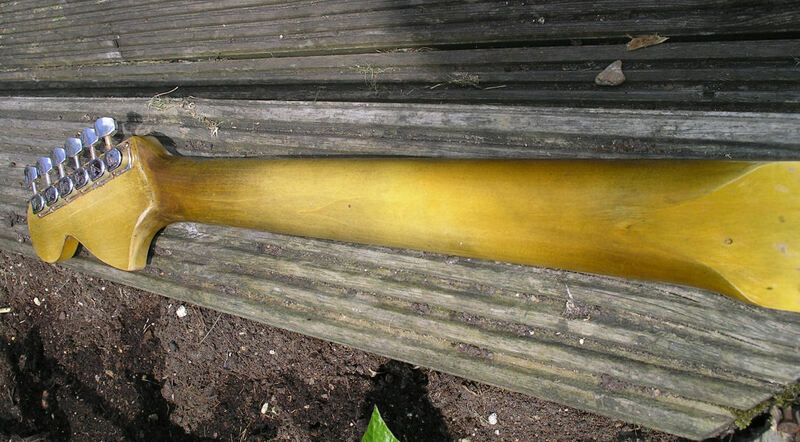 I've had this happen with slabboard necks I'm not sure if it would with a veneer neck but it's not worth the risk. 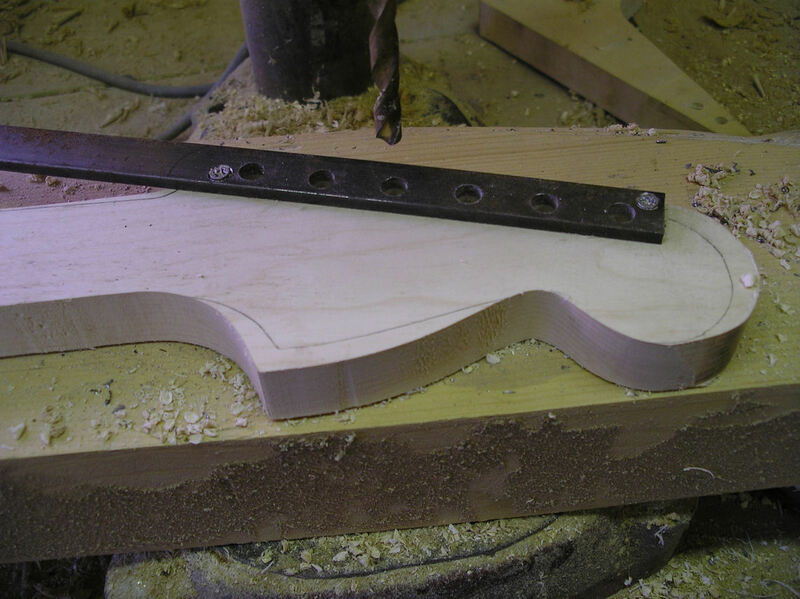 My recently made fret cutting jig, makes the job accurate and easy, leaving the neck profile square makes it even simpler. Using a drill press to press the frets in, I don't know why but sometimes it seems easier with a hammer and sometimes with a press, it's also worth going over the fret slots with a triangular file especially in harder woods like ebony just to give the frets an easier start, it also ensures that the frets seat nicely to the fretboard surface. Don't forget to fit and finish the marker dots first! 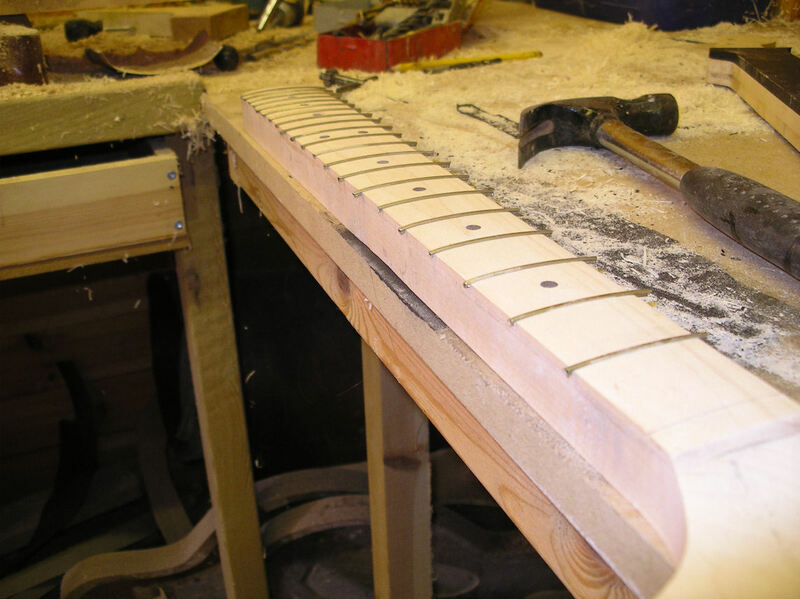 And this is the main reason why I leave profiling the back of the neck until last, it's far easier to fit the frets when the neck sits firmly on the bench. All the frets fitted, I always have a close look at each fret after its been pressed in also another look when they're all done, if any look slightly high a tap with a hammer finishes things off. I have no fixed rules when it comes to using glue on frets, wood is so variable and to a certain extent fret wire can be, so I tend to see how things go. 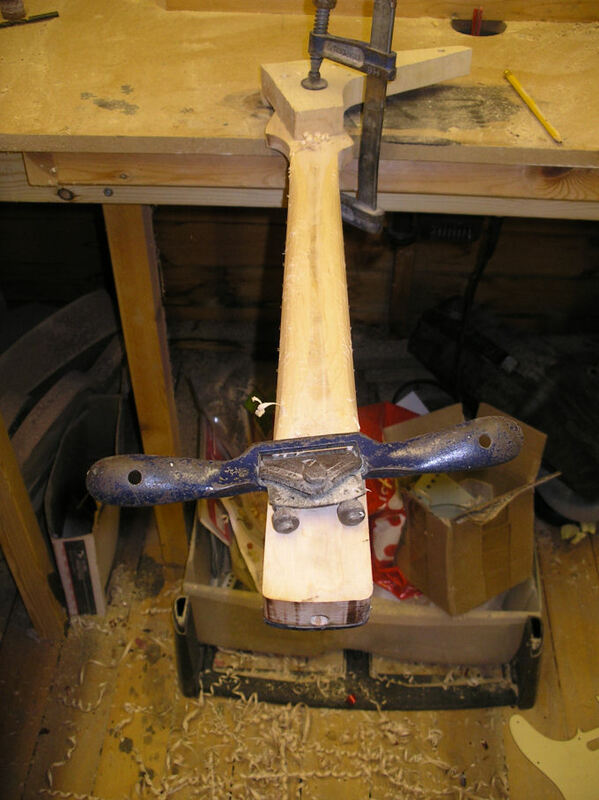 With this neck the frets seated VERY well with no tendency to lift at all. When it comes to using glue I don't thinK there are any hard or fast rules, generally at the least I will "wick" superglue on to the edge of each fret. Not a very good picture but just to demonstrate my very basic approach to shaping the neck profile. 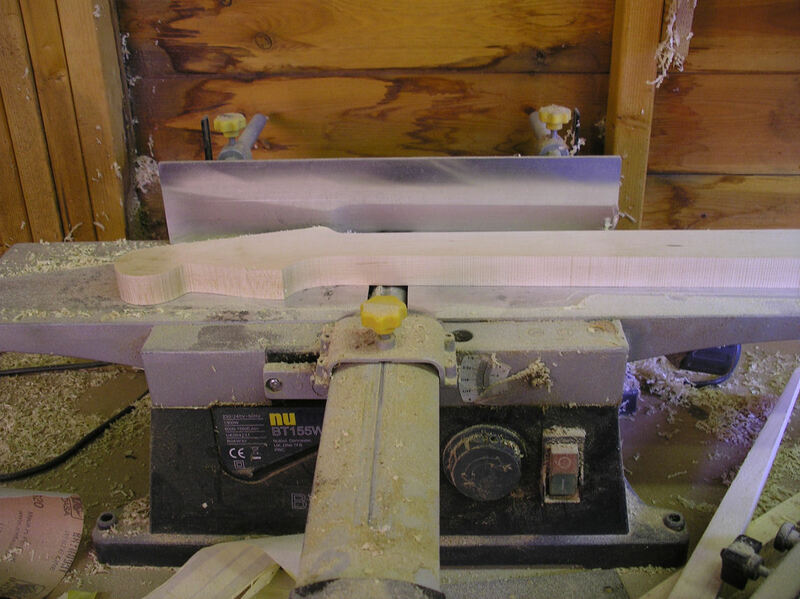 I've tried various machine tools like large quarter round router cutters and band-sawing some of the shape, but at this late stage of manufacture I kind of like the security of doing it by hand. So it may look a bit of a long-winded method but I'm safe in the knowledge that the neck won't turn into firewood just because of one slip! Before I get going with the spoke shave I cut the waste fret wire from the ends of the frets and roughly file them down to within say a 16th of the fretboard edge, I don't want to risk knocking them out of place when shaping the neck. 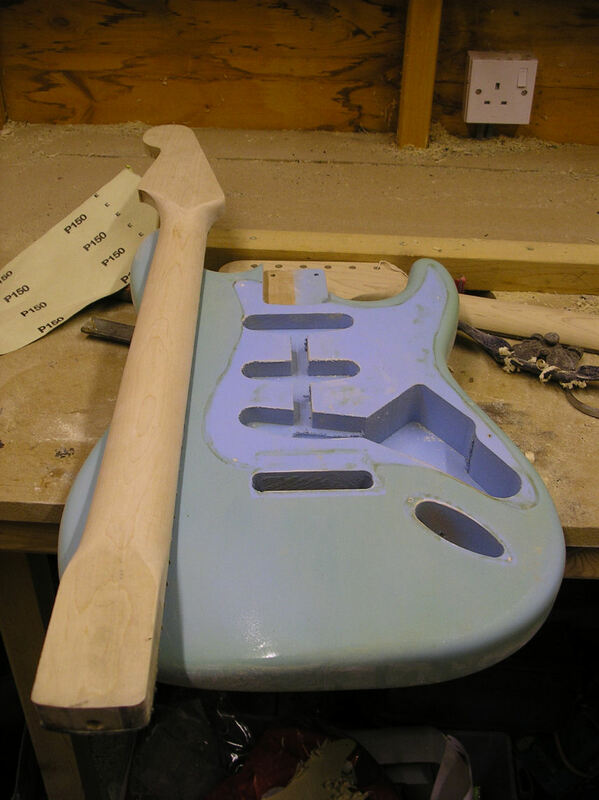 A few hours later and here's an almost finished neck (with a Daphne blue SC body) This is not the maple cap neck, it's one of the other rosewood veneer necks. 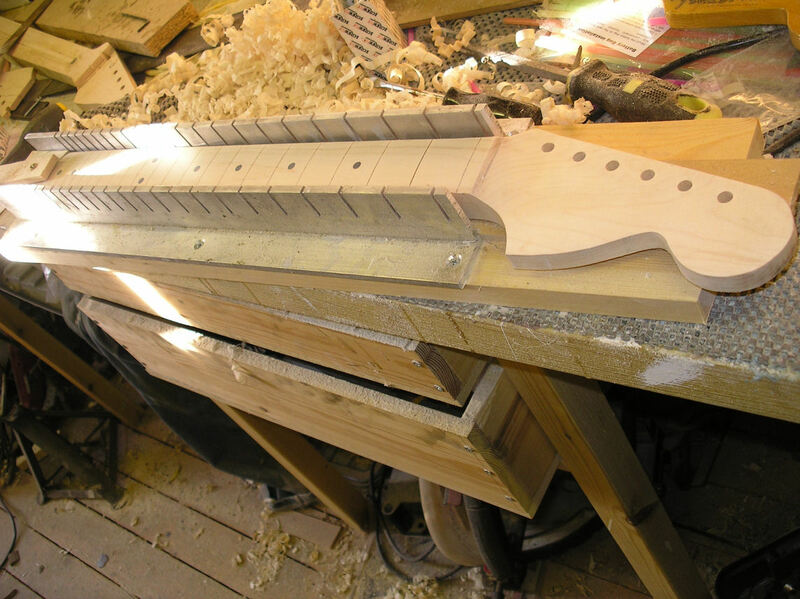 Still plenty more hours of work to do, fret end finishing, stoning the frets flat and re crowning, nut fitting, lacquering, I guess there's a reason why necks aren't cheep anymore!